To every people there are certain rights that are inherent, inalienable, and indivisible. They are upheld and protected not because of the generosity of any particular state or government but because of the human condition of the people they refer to. Ever since the Zionist colonizers settled in Palestine in the late 19th century Palestinians have been denied the exercise of their right to freedom and independence in their homeland. The creation of Israel in Palestine in 1948 provoked untold human rights abuses both in terms of the collective rights of the Palestinian people to self-determination and in terms of their individual human rights. While the Universal Declaration of Human Rights (UDHR) outlined ample provisions guaranteeing civil and political rights including the rights to life and liberty of all peoples, Israel has stubbornly refused to conform to these international norms. One of the most flagrant violations of the UDHR concerns the estimated 6 million Palestinian refugees. While Article 13 of the Declaration explicitly states that, “Everyone has the right to leave any country, including his own, and to return to his country,” Palestinians, are still denied this fundamental right after six decades of forced exile. Expectedly, a few have acquired citizenship in their places of exile; yet the vast majority have remained stateless refugees. In the Occupied Palestinian Territories the process of expulsion continues relentlessly. This cycle of “ethnic cleansing” is most evident in Hebron and Jerusalem today. Since the start of the occupation in 1967 more than 50,000 Palestinian Jerusalemites have been forced out of the city. More than a quarter of them were forced to leave due to lack of housing in Jerusalem. Despite their continuous residence in the city, thousands of Palestinians have been forced to live on its peripheries as a consequence of the Apartheid Wall, high rentals, exorbitant taxes and severe restrictions imposed by the Israelis on construction and family reunion. Many of them were never issued with identity cards and have, therefore, lost the right to reside in the city under Israel’s discriminatory laws. The actual aims of this policy, though undeclared, are to expand Israeli territorial control, confine the Palestinians to isolated enclaves and break their will to be free and independent. Invariably, it is not just the loss of houses with all their memories that are destroyed. Very often personal papers and documents are also ruined. Such losses have a great impact on the mental state of the victims. In Gaza the attacks have been widespread and far-reaching affecting tens of thousands of refugees in Al Maghazi Camp, Bayt Hanun, Bayt Lahiya, Baldat al Showka, Al Shujaiyah and Hayy Shaykh Ridwan districts. Most of the attacks on Palestinian towns and villages take place in the dead of night with huge numbers of tanks under air cover. The target areas are usually sealed off before being subjected to heavy shelling. A typical operation would entail a telephone call in the dead of night to the target occupant who if lucky would be given a few minutes to gather his possessions and vacate his house. Several elderly people have been killed before their relatives could evacuate them. The demolitions of homes are usually carried out as ‘reprisals’ for suicide bombings or on the pretext that the house was used to hide weapons for the resistance. The international community’s indifference and unwillingness to establish a special tribunal to press charges of war crimes against those responsible for these acts have only served to encourage more Israeli aggression. What happened in the Security Council after the Bayt Hanun massacre in November 2006 was, to all intents and purposes, a signal for the Occupier to continue its campaign. Elsewhere, in East Jerusalem, the Apartheid Wall that passes through the Palestinian neighbourhoods has drastically reduced the number of Palestinians in the city and transferred them to the West Bank. The scale of the humanitarian disaster is highlighted in the Shufat area, which together with its refugee camp has a population of 55,000. Upon the completion of the Wall they would be effectively excluded from East Jerusalem. Residents of several other areas would suffer a similar expulsion. They include Abu Dis, Anata, and Al Eizariya. In geo-political terms the current policies seek to carve what remains of the West Bank into three regions that are isolated and hemmed in by the Apartheid Wall and other barriers. Ultimately, it would block any possibility of geographic continuity between the component parts of a Palestinian state. At the heart of the current campaign is the expansion of Israel’s settlement activity in the West Bank. It aims to create ‘facts on the ground’ which would be difficult to reverse in future. In his exchange of letters with Ariel Sharon in April 2004 President Bush gave a ringing endorsement to the settlement policy saying that the Palestinians must learn to live with the new realities. By allowing these ‘new realities’ to be created on the ground the international community has demonstrated the extent to which it is prepared to sacrifice its principles and laws to accommodate Israel’s insatiable demands. The Wall that Israel initially claimed was a security measure has now proved to be an instrument used for the acquisition of more Palestinian territory. Many of those who were most vocal in their opposition to the International Court of Justice (ICJ) advisory ruling on the wall have since remained silent on the ongoing demolition of Palestinian homes in East Jerusalem and the violent takeover of their homes by Israeli settlers. Neither have they denounced the violence used by Israeli soldiers and police at checkpoints throughout the Occupied Territories. Three years after the ICJ issued its advisory opinion on the legal consequences of Israel’s construction of a wall in the Occupied Palestinian Territories the Security Council is yet to approve the ruling. On the contrary, it studiously avoids making any reference to it. The apparent reason stems from the fact that the US still refuses to recognize the ruling of the ICJ that the construction of the Wall and the settlements were illegal and they should be dismantled. Despite its renowned claim to democracy and civility, Israel has a long established record of disregard for the humanity of the Palestinian people. From Deir Yassin (1948) to Sabra and Shatila (1982), Jenin (2002) and Bayt Hanun (2006) the mass killings of Palestinians have continued unabated. Although these summary and extra-judicial killings have been extensively documented by human rights organizations including Prof. John Duggard, the United Nations Special Rapporteur for Human Rights in the West Bank and Gaza Strip, there are very few instances where soldiers and settlers have been convicted in Israeli courts. Significantly, where convictions of unlawful killings were obtained the penalties meted out made virtual mockery of all codes of justice. A notorious example of this occurred in November 1996 when an Israeli military court in Jaffa convicted four soldiers for killing 18 year-old Iyad Mahmoud Awad Badran on 13th November 1993 in Qabalan village near Nablus. The three military judges, headed by Ilana Stern, rejected a plea bargain agreement between the prosecutor and defence and ruled that each of the murderers should pay a fine of one agora – the equivalent of less then $0.0033. No appraisal of the human rights situation in the Occupied Palestinian Territories would be complete without special mention of Israel’s 2002 assault on the Jenin camp. Women, children and the elderly make up 67% of the camp’s population of which 42.3% are under age of 15. Scores of eyewitness whose accounts are documented in Searching Jenin (Baroud: 2003) confirmed that many of the youngsters were captured, blindfolded and summarily shot. Their handcuffed corpses were later found strewn around the camp. Throughout the last decade the graphic images of Palestinian suffering were caught on camera and beamed across the world. Hundreds of innocent children were killed since 2000 and thousands more have suffered life-long physical and psychological injuries. In Palestine, the names Muhammad ad Durra, Iman Hajju and Houda Ghalia have been inscribed on the national psyche. In October 2000 Muhammad ad Durra (12 yrs) was shot in his father’s arms in the Gaza Strip. A few months later, Iman Hajju (4 mths) was killed on 7 May 2001 when an Israeli tank shelled her home in the Khan Younis refugee camp. Houda Ghalia’s anguish was also caught on camera on 9th June 2006. Her father, Ali Issa Ghalia, her mother Raissa and five siblings – a one-year-old son and four daughters aged two, four, 15 and 17 – were killed and other members of their family, including two children, were injured when an Israeli shell landed where they were sitting. Some 30 other civilians, including a dozen children, sitting nearby on Gaza’s Al Shati beach were also injured in the Israeli attack. Four days after the killings on the beach in Gaza, on June 13, 2006 the Israelis killed another 9 Palestinians in Gaza during the assassination operation of a leader of Islamic Jihad. Two children were among those killed and at least 20 others were injured. Subsequently, calls by the Palestinian observer to the UN, Riyad Mansour, representatives from the Non-Aligned Movement, the UN Palestinian Rights Committee, the Arab League and the Organization of Islamic Conference all failed to win the support of the UN Secretary General Kofi Annan for a UN inquiry into the Gaza beach killings. Annan told reporters such an investigation would need the consent of Israel. Not too long before, the Secretary General had become personally involved in efforts to establish an inquiry into the killing of former Lebanese Prime Minister, Rafiq al Hariri. Neither the Lebanese or Syrian governments had the luxury of deciding whether to cooperate or not. The dismissive and slight manner in which the international community has dealt with the illegal killings in Gaza is at best a crude reminder of how much they value and respect the Palestinian right to life. Worse still, it seriously calls into question the criteria used to initiate UN inquiries into war crimes. As it stands, only the application of the principles of the international jurisdiction would put an end to Israel’s illegal killings and war crimes in Palestine. In the absence of any meaningful efforts by the contracting parties to the Fourth Geneva Convention for the Protection of Civilians in Times of War, civil society organizations have made several unsuccessful attempts to date to prosecute those Israeli political and military leaders responsible for grave breaches of the Convention to which Israel is a signatory. On their part Israeli diplomats have stepped up efforts to secure guarantees from European governments that Israeli leaders will not be arrested and charged upon entry into their countries. The case of former General, Doron Almog, who narrowly escaped arrest when his plane landed in the UK in September 2005, was a stark warning to all those involved in human rights abuses and the illegal killings of civilians. Several months later when faced with widespread international condemnation over its killing of 19 civilians in Bayt Hanun on 8th November 2006 Prime Minister Ehud Olmert attributed the crime to a technical fault. Even so, the fact is someone in a position of authority gave the order to open fire on the two apartment buildings. Who gave the order and who executed it is still not known. As was the case after the Jenin massacre, an attempt by the UN to send an international team of investigators to Gaza was aborted because of Israeli obstruction. If any one thought the departure of Ariel Sharon from the Israeli political scene in 2006 would bring respite to the Palestinians they were grossly mistaken. After coming to power Prime Minister Ehud Olmert has presided over the bloodiest and deadliest period of the 58-year history of state of Israel. Since the end of March 2006, Israeli forces fired an estimated 6,000 artillery shells and more than 80 missiles into the densely populated Gaza Strip. More than 50 Palestinians were killed and about 200 were wounded in these attacks. With an average of one Palestinian killed and four wounded per day, the Olmert administration has surpassed its predecessor in terms of its impunity and illegal killing of Palestinian civilians. Time will tell what incentives are given to those who wage this campaign today. The mass circulating Arab newspaper Al Sharq al Awsat [12/11/2006] cited a retired Israeli officer, General Ishak ‘Pundak’, in the Israeli daily Maariv, that Sharon during his term as head of operation in the Southern Command – Gaza Strip – in 1967 used to reward every soldier that killed a Palestinian with a bottle of champagne. Since the signing of the Oslo accords, the rate of detention of Palestinian children has increased beyond all expectation. They have borne the brunt of what President Mahmud Abbas described as Israel’s ‘state terrorism.’ In 2004 a study by the British Medical Journal reported that in the first four years of the Al Aqsa Intifadah two-thirds of the 621 children killed by the Israelis died from bullet wounds directed to the head, neck and chest. Understandably, the effect of Zionist abuses upon these children has been catastrophic. Apart from their detention and interrogation, many suffer injury in unprovoked attacks by Jewish settlers. Those held in incarceration are denied the right of education and visits by relatives. Thousands more have been affected in one way or another by the frequent closures of the territories, sonic bombs and harassment at checkpoints. Once captured, Palestinian detainees are blindfolded, taken to interrogation rooms, and subjected to prolonged torture. One common form of torture involves assaults to the private organs not only because of the severe pain which this causes, but also in order to damage their reproductive systems and minimize signs of physical abuse. Other forms of abuse include; forcing detainees to remain seated in tiny chairs for days, violent shaking of the head which can result in death, prolonged periods of sleep deprivation, exposure to extreme heat or cold, deprivation of access to a toilet, cigarette and electric burns, severe beatings with hoses, cables and sticks, and placing the head between legs for many hours. In addition to the above methods, Israeli interrogators often resort to psychological terror such as threatening to kill prisoners, assault of their wives, mothers or sisters, and threatening to inject them with drugs that can cause madness or sterility. Even under these harrowing circumstances prisoners are often denied access to medical and legal consultation. Had they been accorded adequate international protection these violations of Palestinian human rights would not have continued for so long. No amount of foreign aid can repay or make the victims forget their losses. For the thousands of orphans nothing can replace the love and affection of their parents. Surely the absence of justice can only serve to fuel the conflict. There is, therefore, absolutely no excuse or justification for the ‘turn the other way’ policy pursued by the international community. Thus far, concerted demands from Palestinian human rights organizations for immediate international intervention have all fallen on deaf ears. On the contrary, several countries have gone against their own laws to support Israeli abuses. Britain, for example, continues to supply spare parts for apache helicopter gun-ships, computer components and communication equipment to Israel despite clear instructions that this should not be done where there is a ‘clear risk’ that they ‘might be used for internal repression.’ [The Guardian 15/11/06]. Altogether, the above-mentioned crimes represent a mere fraction of Israeli abuses and violation of Palestinian human rights. It does not feature the abuses carried out against Palestinians in Israel. Since the commencement of the so-called peace process, conditions have become considerably worse. If a lasting peace is to be secured in this region the international community must ensure that the rule of law is established and adhered to by all parties. Under no circumstances does military might render policies of ethnic cleansing right. There are actually no legal or moral reasons why Israel must be allowed to violate international conventions through its insidious campaigns of extra-judicial killings, terror, and torture of Palestinians. If, moreover, a major catastrophe is to be averted in this region the civilized world must act swiftly and decisively to investigate and bring to justice all those responsible for the summary executions, massacres, aggressions, and torture of Palestinians. Without the immediate and unconditional fulfillment of these measures, the ideals outlined in the UDHR would remain empty slogans which betray both the weakness and prejudice of its makers as well as their shared responsibility in the crimes against humanity committed by Israel. The family of nations bears a solemn historic responsibility to protect the human rights of the Palestinian people. Daud Abdullah was born in Grenada where he received his early education. He obtained his first degree from the University of Guyana in 1981 and was awarded a scholarship to study Arabic language at King Saud University in Saudi Arabia. In 1984 he joined the University of Khartoum, Sudan to pursue postgraduate studies and was awarded his doctorate in 1989. His last posting in Saudi Arabia was as editor and translator at the Abul Qasim Publishing House in Jeddah. He then lectured in history at the University of Maiduguri in Nigeria. 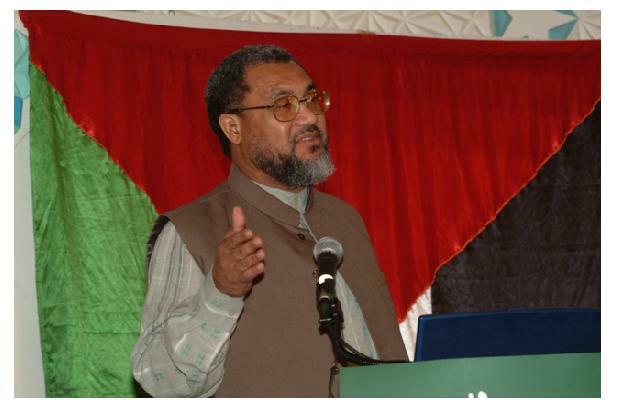 Since moving to the United Kingdom with his family in the mid 1990s Dr Abdullah was senior researcher at the Palestinian Return Centre, London. He has been a regular contributor to Impact International and the Palestine Times. He is editor of ‘The Israeli Law of Return & its Impact on the Struggle in Palestine’. Dr Abdullah comments on Palestinian affairs in the British and Arab media. He is the Director of Middle East Monitor (MEMO) an independent UK based media research institution which seeks to foster a fair and accurate coverage in the Western media of Middle Eastern issues and in particular the Palestinian issue. Think Palestine: Boycott Israeli Dates this Ramadan!